Legend mode is a story-based campaign that takes players across a variety of large-scale maps, telling a story that sees the worlds of Ocarina of Time, Twilight Princess, and Skyward Sword collide due to the machinations of evil sorceress Cia. Each stage limits your character selection, ensuring you'll get a go with most of them as they're unlocked, and presents some delightful environments that accurately portray their representative videogames without artistically clashing. 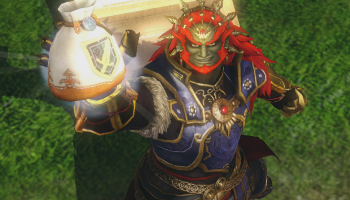 The story isn't exactly award-winning stuff, but it's decently told, and even offers a few smirk-worthy narrative twists, especially once Ganondorf gets a turn in the spotlight. In any case, there's just something utterly enchanting about seeing previously unrelated Zelda protagonists and antagonists interacting. Plus, Zant is highly amusing, exactly as he should be. As with regular Zelda games, dialog is presented via text, with various gasps and gibberish noises used to represent character voices. The only real voice acting comes in the form of a narrator between Legend stages, who recounts the story and sound very awkward in doing so. The game could have done without the narration, because it's not very good. A minor complaint, but I had to get it out there. Adventure mode is a mash-up of various challenge stages, set out on a grid-like map layered with NES-style graphics. Each square on the grid represents a new battle, in which powerful weapons or new playable warriors might be unlocked. To progress across the map and attain the best rewards, players will have to complete stages with high rankings, scoring points based on completion time, damage taken, and number of kills. Generally, beating a stage within fifteen minutes and killing 1500 enemies per stage will get an "A" rank, though some battles have slightly different objectives, and thus different ranking requirements. There's a load of stuff to do in Adventure, and the mission variety keeps things interesting. Some battles are based entirely around one-hit kills, with players having to fight incredibly carefully, while others are "quizzes" that put you in an arena with two enemies and hand out a clue as to which one needs to be defeated. Others are simply pitched battles with regular rules, while others are smaller skirmishes or mini boss rushes. Completion of an Adventure stage usually earns a special item based on the original NES Legend of Zelda, which can be used on each unlocked square to net a weapon or warrior. In "Search" mode, the Compass can be used to locate a hidden object on the screen, and other items are then used to uncover said object. For example, the compass may reveal that something is hidden under a rock, and if you have a bomb, you can use it to unlock whatever's obscured underneath. Stages may need to be replayed in order to keep a healthy stock of items, but the rewards can be worth it. Finally, there's a Challenge mode that will update via an online connection with new specialized tasks, the first of which is a simple time attack mode through the forest, charging players with the goal of completing as many objectives as possible as soon as they can. It'll be interesting to see if this continues to update, but for now, it's a nice little extra and nothing more. There's a huge wealth of content on offer between Legend and Adventure mode, and in addition to thirteen characters to level up, there's a crafting system that combines materials earned in-game to create badges for every warrior. Badges add new combo attacks and a wealth of passive abilities that prove damn near essential when it comes to facing Hyrule Warriors' tougher difficulty modes. Weapons can also be combined with those who have random empty "slots" in them, allowing one to mix and match attributes - a fun feature cribbed from other Warriors games, but disappointingly limited since you can't add empty slots to existing weapons, severely restricting what can be combined. The real charm to Hyrule Warriors is, of course, how the game drips in references and callbacks to the Legend of Zelda series. With familiar sounds and music, the classic opening of treasure chests, the appearance of the Moon from Majora's Mask, and the presence of ever-vengeful Cuccos, there's a ton of stuff to paint a grin on a Zelda fan's face. My one grievance here is the almost exclusive focus on three games. There are several all-original characters that could have been replaced with the likes of Skull Kid, Agahnim, or Tingle, but because only Ocarina, Twilight, and Skyward are fully represented, this is not quite the comprehensive tribute to the series one might hope for. All that said, this is still a real treat, packed with love for a Nintendo classic. The visuals are absolutely wonderful, too, with nostalgic Zelda designs getting some flamboyant influences from Omega Force to create stylized, Warrior-esque versions of beloved characters. The work done on Zelda and Ganondorf stand out as particularly excellent renditions of the characters, and let me say just how awesome it is to play as both of them outside of Super Smash Bros. Add to that some deliciously cheesy rock-tinted takes on the Zelda soundtrack, and this is one tasty package. Bottom Line: Omega Force superbly balances the beat 'em all combat of Dynasty Warriors with the enchanting world of The Legend of Zelda. With a meaty combat system and tons of stuff to uncover, Hyrule Warriors is a mad idea that should logically get old after an hour, but never does. It's a novelty that can't quit being novel, and I love it to death. Recommendation: If you don't like Dynasty Warriors, this may wear thin, but for everybody else, it's very much worth diving into.